Jonah Murtag is an Acolyte on the New Bethlehem police force. His job: eradicate all heretical religious faiths, their practitioners, and artefacts. Murtag's got problems - one of his partners is a zealot, and he's in love with the other one. Trouble at work, trouble at home. Murtag realizes that you can rob a citizenry of almost anything, but you can't take away its faith. When a string of bombings paralyzes the city, religious fanatics are initially suspected, but startling clues point to a far more ominous perpetrator. If Murtag doesn't get things sorted out, the Divine Council will dispatch The Quints, aka: Heaven's Own Bagmen. The clock is ticking towards doomsday for the Chosen of New Bethlehem. And Jonah Murtag's got another problem. The biggest and most worrisome... Jonah isn't a believer anymore. I’m getting concerned for Nick Cutter’s sanity, really. His website is definitely showing signs of split personality: on its home page, you’re asked to choose between Craig Davidson, author of the acclaimed literary novel Cataract City (that’s the nice guy), and Nick Cutter, his utterly non secret dark side whose only call in life is to make you screech in terror and disgust. The latter published The Troop – you won’t ever be able to bear the sight of a maggot anymore – and The Deep – the impossible rewriting of Abyss by Lovecraft. I was expecting the same kind of gory display in The Acolyte but apparently, another facet of Craig/Nick’s personality is popping out! Oh, this new novel is graphic enough to qualify as horror, no doubt, but it’s still another sharp turn: it’s more of a crime investigation and a thriller; and above all, it’s a social commentary wrapped around a dystopian fiction. Oh, and it’s also Nick Cutter’s best novel so far. So what is it about? In The Acolyte, North America is governed by an extreme and oppressive dictatorship loosely based on Christianity: its “New Republican Testament” sums it up perfectly by declaring “The Church IS the State”. Each city is also ruled by a Prophet (yep, that’s a lot of enlightened dudes) who manages the population through mass indoctrination, cult of personality, and a criminal justice similar to the middle-age Inquisition in Europe. Our protagonist is Jonah Murtag, an elite soldier focused on “faith crimes”. His team raids all sort of black sheeps from families worshipping a different god to political dissidents to mere collectors of heretical objects such as books and pop music records. When the plot starts, a series of bombing attacks are shaking the city of New Bethlehem. One day, when Jonah himself witnesses a suicide bombing, he gets a tremendous jolt: the terrorist “profile” contradicts all the official announcements. From there, a perilous investigation will lead him to shed new light on New Kingdom’s government structure. The bomber was the wrong colour. 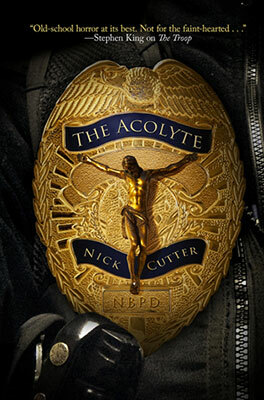 You will first notice that The Acolyte has the most impressive background of all novels by Nick Cutter. The Troop was confined to a small island and The Deep to a minuscule science station in the deep-sea, but The Acolyte takes place in a huge, bustling city, on which a remote, obscure but ever-present central government is looming. I really appreciated the depiction of this society, from its sharply distinct social classes and neighbourhoods, to its multitude of characters with their own specific attitudes toward the Prophet. I enjoyed how Nick Cutter imagined the many facets of extreme ideology and its social effects. The Acolyte felt much more plot-driven than The Deep (which was more a succession of horror scenes): while both The Troop and The Deep were mostly survival horror stories, The Acolyte really emphasizes Jonah’s investigation, faith crisis and character development. It’s really about Murtag discovering the (sick) mechanisms behind his society and his change of heart about it. If you liked Aldous Huxley’s Brave New World or Walter Tevis’ Mockingbird, you will enjoy this novel. What is it that animates us if not the soul? But sometimes you come across a person and in him sense a lack of human capacity. The standard measures of tenderness or mercy. Which leads me to my favourite aspect of the book: the social commentary. Even though The Acolyte takes place in a religious dictatorship, I believe the book isn’t against any religion in particular: the society of New Kingdom rests on an extremely distorted vision of Christianity and a completely imaginary religion would have done the trick all the same. Neither is it against religion in general: what makes the society of The Acolyte a dystopia is its extreme ideology, intolerance, brain washing and persecutions, complete lack of (fair) justice, control of the media, systematic destruction of cultural heritage, and a certain apathy amongst the people. Too many citizens in The Acolyte have completely lost their inquisitiveness. For instance, Jonah has to witness something that grossly contradicts the official declarations of the Prophet to finally have some doubts about its veracity. That’s what I really liked in The Acolyte: it tells you to not blindly believe in anything; it tells you to think for yourself, be inquisitive, and cherish free access to culture. Just a book? By that argument, son, the serpent in the Garden was only a serpent. A book is never just a book. Do you think we can simply allow people to go around reading whatever they choose? There is no God but God, and The Prophet is his mouthpiece. In short, The Acolyte must be praised for being not only the best, but also the most thoughtful story by Nick Cutter. I loved the larger world, the multitude of characters with their various attitudes toward society. It’s also a riveting investigation that will make you reflect on extreme ideology. Finally, this book is definitely for the horror fans since it’s very violent, very graphic, and at times absolutely disgusting. I haven’t read The Troop and I didn’t finish reading The Deep because I wasn’t enjoying the story, but this book sounds like it has more of a substantial storyline. Have you read any of the Craig Davidson books? Not yet! I’d like to try Sarah Court! I didn’t know Nick Cutter had another book out already. Surprisingly, I liked The Troop, but this one sounds even better. I’d also like to give his other half a try sometime. I’ve heard Cataract City (is that what it’s called?) is also pretty graphic. Cataract City, yes! There’s also The Fighter, which apparently is close to horror and is also a social commentary. It’s well rated on GoodReads. I really enjoyed both of his earlier horror novels (and Cataract City was impressive too – I still remember a couple of scenes quite vividly even though it was more of an ordinary story, comparatively speaking) so I’m quite looking forward to this one.